In search of a future that may not exist and faced with the decision of who to share it with, Cassia journeys to the Outer Provinces in pursuit of Ky - taken by the Society to his certain death - only to find that he has escaped, leaving a series of clues in his wake. Cassia's quest leads her to question much of what she holds dear, even as she finds glimmers of a different life across the border. But as Cassia nears resolve and certainty about her future with Ky, an invitation for rebellion, an unexpected betrayal, and a surprise visit from Xander - who may hold the key to the uprising and, still, to Cassia's heart - change the game once again. Nothing is as expected on the edge of Society, where crosses and double crosses make the path more twisted than eve. Ky and Xander, the love interests for Cassia are what made me keep reading this book. They were just great. I loved how strong and independent they were, yet at same time both were vulnerable because of their love for Cassia. This is one of the few times that I can't make up my mind which team I'm on! As much as I loved Ky and Xander, I still had a really hard time with Cassia. Her character just bugged me a lot. I think it's because it took her a long time to grow as a character and realize that not everything revolved around her or Ky. 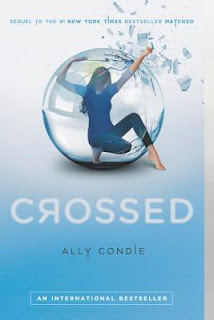 While this book has it flaws and could have been 100 pages shorter, I really can't wait to see who Cassia chooses and how everything wraps up in the third book. Like most second books, I felt like it was filler for the next book, however the ending was a traditional cliffhanger that made me glad I waited to read this until the third book was out!